Bill Bryson is a man with something of a split personality. Despite living most of his life in Britain, he still identifies himself as an American. 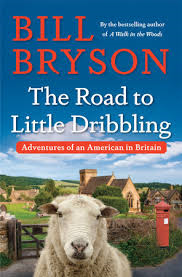 His newest book The Road to Little Dribbling is an updated version of one of his earlier books, Notes from a Small Island. In the earlier book, he traveled around Britain as a fairly new inhabitant of the country and recorded the towns, customs and people that were strange or endearing to him. Now, some 20 years later and on the verge of applying for British citizenship (he'll retain his American citizenship, too), he decides to travel around the country again and see what has changed. Unfortunately, all the changes he notes seem to be for the worse. Whether all of Bryson's complaints have to do with the deterioration of British society as a whole, or the fact that at age 63, he's descending into Grumpy Old Man-dom, is hard to tell. Certainly, he notes (very frequently) how towns he visited many years ago have gotten much worse than he remembered. Of course, a great deal of this phenomenon has to do with "super stores" coming into even the smallest towns and villages and driving independent stores out of business. This leaves the main (or high) streets largely derelict and boarded up -- not charming at all. In Britain, the culprit doesn't seem to be Wal-Mart (Asda), but Tesco. The Tescos I've visited have been grocery stores rather than everything-under-one-roof-emporiums, so where the people in these villages go for motor oil, nails, vacuum cleaners and sewing notions, heaven knows. There are traces of his trademark humor, such as early on when his head has an unfortunate encounter with a traffic barrier, or when he is imagining vicious comebacks to annoying people he seems to come in contact with on a regular basis. Otherwise, the book seems to fall a bit flat. Not only does he lament the tired and worn-out towns he visits, but even if there does seem to be something to investigate, he doesn't seem to spend much time looking around because he is always checking to see what time the nearest pub opens and how far away it is. He also seems to harp rather a lot on the problem of littering. Goodness knows, he has an ally in me on this topic, but even I found his frequent rants on the subject a bit tiring. Also, he keeps discussion charity walks and hikes he goes on for various causes that always seem to just be thrown in without much context or explanation. Still, I always admire and enjoy reading about his travels, no matter how grouchy he ends up being! I hope that he will be going on another trip soon, hopefully to somewhere a bit more exotic where he can really get worked up over strange and different customs and people.